Trivia is fun for a good cause – and this week proceeds will benefit a local family in need. Stevie is a co-owner of Woccocon Oyster Co., the captain of the Dream Girl charter fishing boat, and a lifelong Ocracoke resident. Stevie captioned this: "Got my pal with me." On April 9th, he was seriously injured in a freak accident. As he was fueling his truck at the Anchorage Marina, the emergency break slipped and the truck pinned Stevie against the dock. 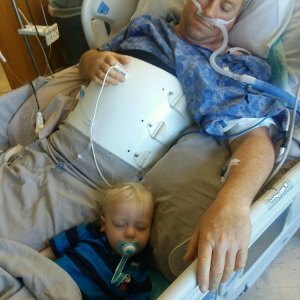 He suffered a broken back, six broken ribs, a punctured lung, and a lacerated liver. He has been through two major surgeries and has a long recovery ahead, but he is strong and strong-willed. It will be several months before he's back to work, but he is expected to recover. Stevie's doctors have said that he's lucky that he's not paralyzed; in fact, he is already walking a bit in his turtle shell back brace. Stevie's wife, Jennifer, is with him at the hospital in Norfolk, along with their two small children, Lily and little Stevie. She's keeping us posted on Facebook about his recovery. When I got her permission to use her photos on the Current, Jennifer commented: "What an awesome village we have. We’d like to thank the community for the support and we look forward to getting home." Trivia isn't the only way to help. Jason's Restaurant staff is holding a $10 lunch fundraiser Sunday, April 29th starting at 11am while supplies last. They'll be serving chicken empanada plates, and baked ham dinners with mac & cheese, green beans, and rolls. Yum! 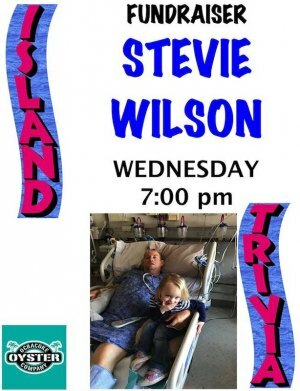 The Ocracoke Assembly of God Church is collecting donations for Stevie. 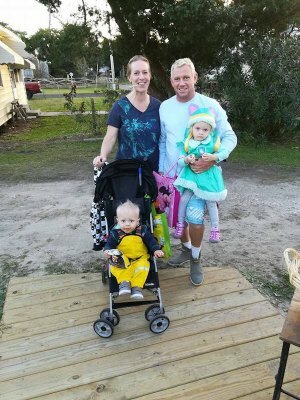 You can mail (PO Box 68, Ocracoke, NC 27960) or drop off a check made to the church with "Stevie Wilson Fund" in the memo line. There's also a fund at Ocracoke's branch of First National Bank, where you can make a deposit. 100% of your donation will go to Stevie. There's also a GoFundMe page set up for Stevie. It's a great way for off-island people to help, but GoFundMe takes a small percentage of the donations for their fee. The way we are all used to seeing Stevie: hard at work as a waterman. 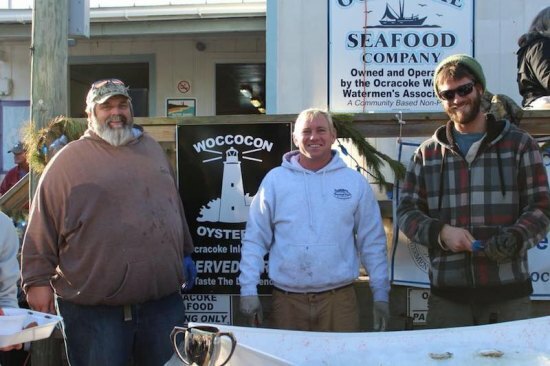 Here he is with his Woccocon Oyster Co. bros Albert O'Neal and Dylan Bennink.